A long time ago we used to have a Friday special on posters for $10 so that our lower-income clients can afford to decorate their walls with motivational messages. We are adding that back now for a limited time due to special request. This is one of our favorites posters because it shows a very positive aspect of eating fruits and vegetables: you get a lot of color, flavor, freshness, and variety. Instead of offering this poster deal for one Friday we will offer it for the whole month of February – just in time for Nutrition Month’s message to go farther with food. Take advantage of this offer now and get everyone you teach to a great start for 2018 now! This poster comes with a free handout download PDF shown in the images above. There are also many matching banners and prizes. Preview the school nutrition education page of the Nutrition Education Store. Use the wish list form to create a list of resources that would benefit your classroom. You can also use the handy order form to request materials directly from your school district. Display your wish list. These wishes can’t come true unless someone knows about them, so make sure to display your wish list in your classroom. Not sure where to put it? Try dedicating a space on your bulletin board during an open house or class parties. That way, parents can take a wish and grant it. Share your wish list. Sharing is caring, after all. 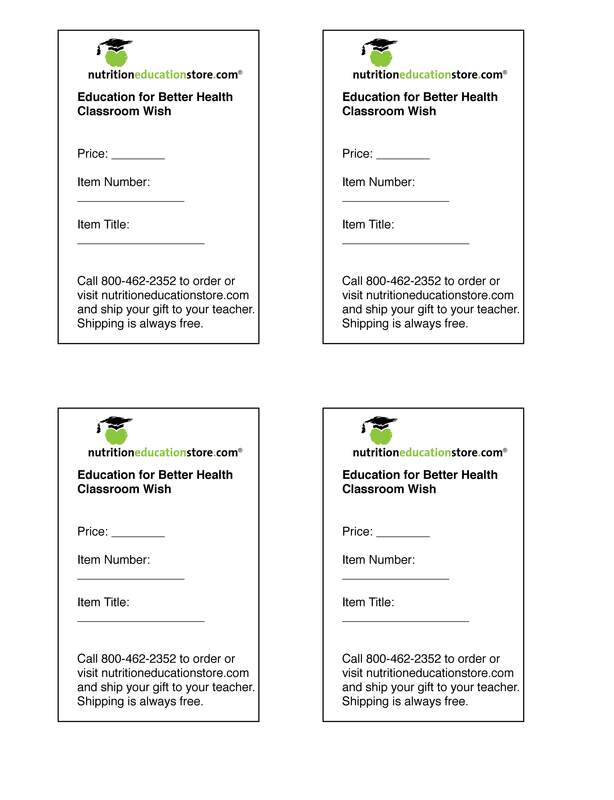 Include your wish list in your class newsletter, in special notes to parents, or on your class’s online homepage. You could also give a classroom wish list to the Parent Resources Organization or “room parent” volunteers. Use this letter to parents to explain the importance of proper nutrition for better classroom behavior and academic performance. Watch your wishes come true. 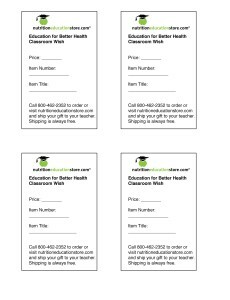 The people who wish to support your classroom by picking up an item on your wish list can easily purchase the materials from our store. Then they can have them shipped to you with a gift message, or they can have the items sent directly to them, so that they in turn can give their gifts to you in person. Thank your donors with special thank-you-notes that express your appreciation for these generous gifts. There’s also Amazon.com. Did you know that we have a list of Nutrition Education Store materials available on Amazon? You can add them to an Amazon Teacher Wish List. Use the Amazon Universal “Add to Wish List” Tool to add any school nutrition education materials to your list. Any questions? Call us toll-free at 800-462-2352. We can even take steps to add more of our materials to Amazon.com.